Also referred to as Hardwar, Hardwar occupies a position in the nature-rich state of Uttarakhand. 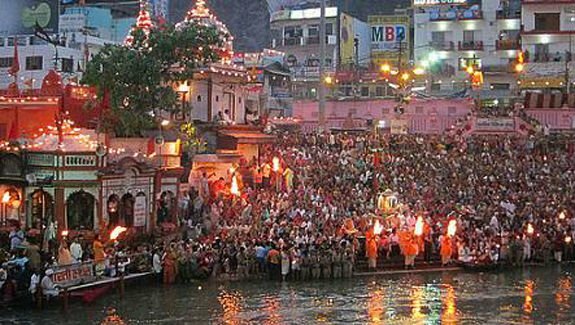 According to the Hindu mythology, the pilgrimage town of Haridwar is considered one of the seven most sacred places of the Hindus. Haridwar is a land of saints and features a rich religious and cultural heritage. 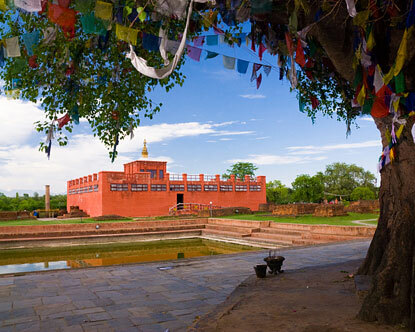 The temples and ashrams of Hardwar are much popular among travellers from all parts of the world. The holy Ganges brings some of the most surreal scenes to visitors. In addition to it all, the pilgrimage destination of Haridwar is also the place where the world famous Kumbh Mela (Fair) is organised every twelve years. It is interesting to note that around 1 crore of pilgrims participate in this gala religious event. A visit to the mythological sites in the town is an absolute opportunity to experience the culture, customs and traditions of the Hindu faith. Best Season - September to June. The words Haridwar and Har Ki Pauri are almost synonymous. It was king Vikramaditya who constructed the ghat in remembrance of his brother Bhartrihari. Also popular as Brahmakund, this bathing ghat is highly revered by the Hindu community. Do remember to visit the ghat at twilight; it is the time when the Ganga Aarti is performed here everyday. During the aarti ceremony, hundreds of diyas are flown along the divine waters of the Ganges as mantras are being chanted. The temple stands in dedication to Goddess Mansa Devi. The much visited temple is located atop the Bilwa Parvat. Apart from watching the two-mouth-and-eight-arm statue of Mansa Devi, travellers can also soak up wonderful panoramic views of the town from here. Use a trolley or a rope-way to get to the temple. Or you can also enjoy a trek to reach there. A must-see place for tourists and pilgrims, the temple is built on top of the Neel Parvat. Constructed back in 1929 by the king of Kashmir Suchat Singh, the temple is just at a distance of 3 km from Chandighat. Visitors can use the trolley or the rope-way to reach the temple of Chandi Devi. Trekking is also a good option to get to the temple. The place has an interesting legend associated with it. As per the mythology, king Daksha Prajapati performed a yagya at this place. As the king did not invite Lord Shiva, Sati (Lord Shiva's first wife) felt insulted and set herself on fire. In the wake of the incident, the disciples of Lord Mahadev killed king Daksha, who was later brought back to life by the lord. A very scenic place in Haridwar, the ashram has the eminence of being the site where the Saptarishis (seven great sages) are believed to have meditated. The site also bears significance as it is here that River Ganges splits itself in seven currents. This is an important mythological place for the Hindus. The temple is dedicated to Maya Devi, the Adhisthatri deity of Haridwar. It is also counted among the Siddhpeethas. As per Hindu traditions, it is the place where the heart and navel of goddess Sati had fallen. The Kumbh Mela is one of the holiest Hindu celebrations in India. The mass Hindu pilgrimage occurs every twelve years at Haridwar. As per records, around 60 million devotees and pilgrims come together to attend this highly revered religious mela (fair). This is a much visited Hindu mythological site in Hardwar. The shivling is located in the Harihar Ashram at Kankhal. Apart from this 150-kg shivling, there is the Rudraksha Tree which is seen with keen interest at the ashram. Walking a distance of 1 km from Har Ki Pauri takes you to the Bhimgoda Tank. Hindus believe that the tank was created as Bhim, one of the five Pandavas, hit his knee against the ground. It happened while the Pandavas were going to the Himalayas and passed through Haridwar en route.